We go the extra mile with a reinforced storm room. Let our massage therapist relax those tired muscles. We're a first class RV park with paved sites, patios & showcase bathrooms located near Memphis & Tunica. Awesome park! Clean with concrete pads. Easy in and out. Wonderful dog park! They have all amenities you need traveling, plus some. Most important to us when we travel is the management/owners ...they are very nice, friendly and go out of their way to accomadate. Highly recommended ! We stopped on our way to Florida and made sure we stopped again on our way home back to Missouri . Excellent RV park. Good location and close to a plethora of retail sites, food, fuel, shopping. Easy, level pull throughs. No hassle maneuvering to get to or out of site. Discovered this one by chance as our planned RV park didn't like our pet breed. EZ Daze had no problem with our 11 y.o. doberman. We stayed here again on our return trip from Alaska 3 months later, and still a terrific place. Will definitely stay here again. I really like this park. Blacktop roads and concrete pads. Plenty of room to get the 5th wheel in and out of the site. Very clean restrooms. Nice staff. Will stop here next time we are through. We stayed for two nights. The sites are clean and well maintained. The spots are pretty close together but it was very quiet. It’s close to the highway and the airport . We heard some plane traffic but it never really bothered us. There is a great dog park that my puppy enjoyed. Propane is onsite which was popular due to the unseasonably cold weather we encountered. There are three washers and three dryers available. They were premium on a Sunday afternoon but everyone was courteous and took care of clearing their laundry as soon as it was finished. We have stayed here several times. The staff here is very friendly and helpful. This is not a resort destination in itself, but provides a great place to stay with easy access to the Memphis area. Definitely one to stay at again. The facilities are very clean and modern as is the campground itself. The WiFi is very slow as most RV parks. I could not get a good cable signal for watching television but, as there is so much to see in Memphis, we weren't in our travel trailer very much. The staff is fantastic! They're very friendly and accommodating. The park is located so it's an easy drive into Memphis. What a nice clean and quiet RV Park. Bathrooms and showers were spotless! Spaces were wide and long. I will make this my go to place when I am in the area again. This was one of the nicest places I stayed in my 21 day trip. Very nice park, pleasant friendly staff. We stayed two nights; a Monday night and a Friday night. Both times we stayed in a pull thru site; nice and level. There are many long term guests here but they are all well kept. The pool was closed for the season. The bathrooms and showers were all very clean. Would definitely stay here again. 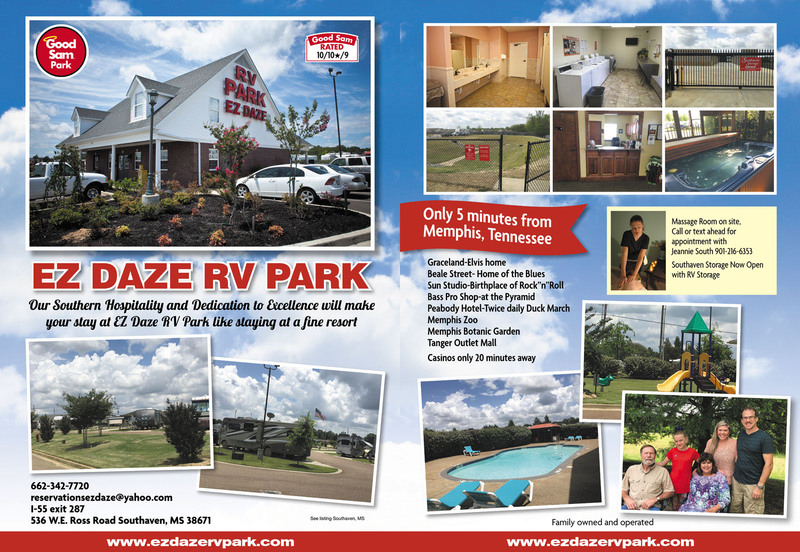 The EZ Daze RV Park is one of the best RV Park we have stayed in. Very clean and kept up the staff is by for the best. After they got us check in we ask them about the best place to get some good BBQ in Memphis and we were told to go to Memphis BBQ about two miles up highway 55 and it is the best BBQ you could ask for. On our way back through Memphis we are going to stop and eat there again. If we need to spend the night in Memphis we will stay there again. Now this park is a "real 10". From the moment you drive in, it is immaculate and clean, landscaping is excellent. The sites are in fact concrete slab and "level" with parking for you tow vehicle or guest. Only pitfall during our stay was the amount of rain and standing water in the grass. The pool and hot tub are excellent as are the restroom facilities. One of a few parks that actually has a storm shelter for the nasty afternoon storms. One big consideration for us when choosing an RV park is whether or not there is an off-leash dog park. Well, this one has one of the biggest and best! It is a water retention area but my dogs loved it! We did not use the pool or hot tub because we were only there one night on the way back fro Florida and we had a long travel day! They looked very nice. The sites here are level with plenty of space between the sites. The WiFi worked well and the park was quiet. There are jets flying over at night but they didn't bother us at all. We would definitely return here and spend more time exploring the area and visiting Graceland and other attractions in the Memphis area. This one is a keeper! Stayed three nights in a pull through. We have a 28 ft travel trailer. Pluses: Great staff. Nice, modern restrooms and good laundry facility. Clean and manicured. Level, concrete and asphalt sites. Easy to find. Grass between the sites. Water and wifi are good. Minuses: The noise!! Barking dogs and long term residents who tend to be up walking around and talking loud at night. Added to the FedEx planes flying overhead and generators running all night meant no sleep for most of our stay. Also, the only street light at the pull-through sites is very bright, so unless you have blackout curtains forget about sleeping in the dark. Summary: This is a safe place for a one night stay while traveling through, but I wouldn't stay longer. If you are looking for scenery this is defiantly NOT where you want to stay; the place reminds me of a mobile home park. The spots are way to close to each other; you can hear your neighbors talking at a normal tone while inside your camper. The spots for the picnic tables are also way to small. Oh and this may not be any issue for some but there is only parking for one vehicle at your site. On the plus side the staff is very nice. Outstanding campground. Stayed in a pull-through site in the original park in a 36 ft motorhome. Their concrete pads are actually LEVEL. As in big-rig, no-fuss, seriously level. Not sure we've ever seen a campground with better quality sites, and we've been doing this a long time. Sites aren't full of fancy stuff you won't use, but are exceptionally well constructed. The pedestals all have 50/30/20, cable and heat-taped water spigots. the folks who run this place are the nicest folks ever, and they keep a very family friendly environment here. Planned on one overnight while traveling, but got snowed and iced in for several days due to this winter's storm. Can't think of a nicer place to get stuck. This will be our go-to stop whenever we're in the Mempis area from now on. 34 ft. Class A motorhome, back-in spot in middle of original park Excellent friendly, polite and caring staff. Entire park, including rest rooms, always immaculately clean. 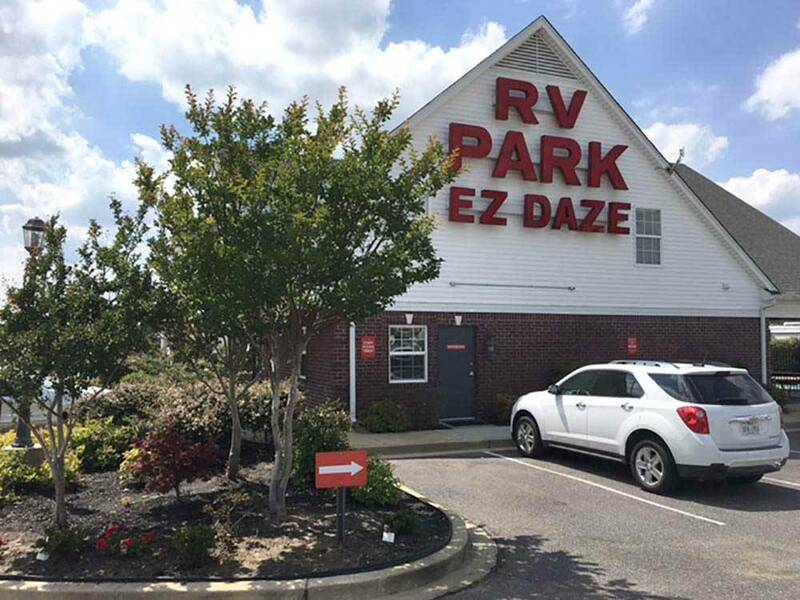 I've stayed at EZ Daze many time and would highly recommend the RV park. Very nice facility. Easy in and out. Close to Interstate with RV Dealership and store next door. Lots of amenities paved roads and concrete pads. Will stop again. I have a son in the near by area and have stayed here several times and highly recommend this park if in the Memphis area. The jets from the airport are a little distraction but all of life is not perfect. Very well maintained, staff friendly and helpfull. This park was very nice, just outside of Memphis, would be a great base for seeing the tourist sites. Nice wide blacktop roads, and concrete pads, pull thrus. The staff was so friendly and helpful. They had a very nice pool. The showerhouse was very clean and modern. There is some jet noise at night, as it is located close to the airport. We would definitely stop here again. This Park is AWESOME!!!! Easy to locate. Signs leading to it are very clear and obvious. Easy entrance and very friendly staff. Site was very clean and kept up. The Dog run was the best!!! The only complaint? The constant final approaching FedEx jets all night long. Didn't bother me as I was tired. But my dear wife did not find the sound of landing jets very pleasant. Would I stay here again?? YOU BET! Only Five minutes to Memphis, and a 'World of Adventure'!